IHG® Rewards Club - Music - F. Drost,Frances Drost - Jacob Loves Legos, Climbing, And Pleasant Hill, Missouri. Jacob Loves Legos, Climbing, And Pleasant Hill, Missouri. 1. 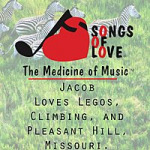 Jacob Loves Legos, Climbing, And Pleasant Hill, Missouri.